If you want to create a gentle and bright image withRomantic notes, you will like the style of the chic chic. 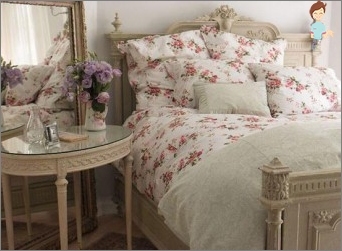 This trendy direction is suitable for the whole house, but in the interior of the bedroom it will look perfect. What is a chic chic? This style is only about 30 years old, and came from Europe, to be exact, from Britain, where the designer Rachel Ashwell managed to instill in her compatriots a taste for exquisite antiques and soft classics. The very word chebby means "Shabby", But the elements of the interior in this style can not be called wretched or shabby, rather - old and sentimental. Limited use of a print - just a faded cell or strip. All together creates an atmosphere of cordiality and peace,In such rooms you want to relax, lead a measured life, luxuriate in bed or lead leisurely talks about anything. Chic in this case means that all the decor items are genuine, have antique or man-made value. You will have to start from the walls, the floor and the ceiling. How much the transformation will be, depends on the condition of the room, but, as in any stylish interior, it is important to have smooth surfaces. The floors should ideally be wooden, but the freshly glazed parquet boards will get out of the general style. You need the effect of quality, good, but old and slightly worn floors. If the room is just such a floor, do it.Elimination of defects - cracks, creaking floorboards, replace some of them, especially ugly ones, the rest can be left. In case you put a new floor, you will be helped by special lacquer coatings and mastics, giving an aged look to the floorboards. For walls, we recommend a painting option - you will easily find the right tone, mixing the pigments themselves with the right color. The walls should be light, in the spirit of watercolor paintings. For wallpaper, the pattern is important: exclusively vegetative symmetrical motifs with a fine pattern and rapport (the size of a repeating fragment). I'll have to try and find such wallpaper on which the print looks like it has faded in the sun. 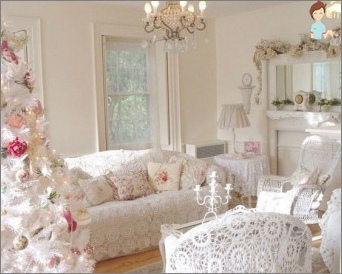 You can not make the wallpaper, so the effect of the shebby is achieved purely through a small pattern and a pale tone. In the cheek chic, wall painting is welcomed, but alsoHere the artist who will perform it according to your order will have to maneuver and resort to tricks to maximally dilute the shades and cover the pattern with a layer of patina (artificial darkening from time), craquelure (artificial cracks) or a special primer. With the ceiling, probably, it will be easier, because it can be simply painted in white with a shade of gray, beige or greenish-blue to make it look like a darkened with time plaster. Real connoisseurs of this style hunt in second-hand stores, on ads, from old-timers, in antique shops and flea markets. How to explain this choice? The fact is that antique furniture is often of high quality, made of natural wood or even a woody solid - a solid board. These are good things, and at first glance it becomes clear - they do not demolish. To restore the upholstery, fittings or repair the doors - little effort compared to the result. It turns out an exclusive subject, which can become the basis for the whole ensemble. Immediately warn: do not bother with old sofas, as the life of this soft furniture is in principle limited, and even updating the upholstery and filler, you will not win in originality. But a chest of drawers, a wardrobe or a bookcase, a dressing table,Table, wooden armchair - vintage or restored - justify the money spent and will make it possible to achieve the very aura of the chic chic to which we aspire. You can buy new furniture in the style of shebbi chic, but then the very meaning is lost - it is impossible to reproduce authentic antiquity in the factory conditions, such items will still require refinement and decoration. In the processing of furniture use a coating inA few layers: the top layer until it dries completely scraped a little to expose the bottom, as a rule, the darker. It turns out very beautiful craquelure. A grid or sandpaper to give a roughness. If you intend to leave one or two in the bedroomA piece of modern furniture, let it be a bed. All the same, the nets and mattresses lose their elasticity over time, they break down. But you can tailor some of the elements of the bed - back, legs, sticks. For a table or shelves, use the technique of decoupage - a favorite reception of designers cheby chic. Variety and mix of styles of the past onlyWelcome! Adhere to only two rules: first - let things be old or look so, the second - everything should prevail and repeat one tone. 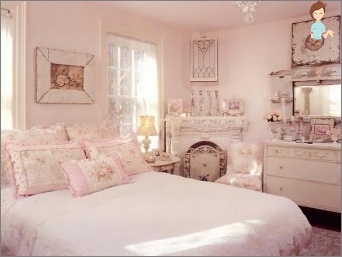 For a bedroom, it can be blue, warm pink, peach, herbaceous, pearly white or ivory, lilac. Grandmother's curtains or heavy curtains with lambrequins. Textiles in the bedroom should not contrast with the bedding, which is better to choose in the classical style - white without a print. Shebbie chic, despite the central ideaTrifles, can become an expensive pleasure, given the exactingness to detail. But, having executed in it even one room, you will come nearer to the atmosphere of unpretentious sophistication and get a trendy interior.